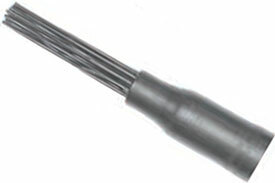 Universal Tool Needle Scaler Attachment for UT8630 Series Scaler. For Use With: Universal Tool Scalers and Needle Scalers. Universal Tools patented line of scalers provide users with ergonomic benefits unsurpassed in the air tool industry. Universal Tool Scalers and Needle Scalers are designed with low air consumption for use with limited air supply or multiple tool applications. Universal Tool Flat Chipping Hammer Chisel. Four Bolt Chipping Hammer Accessories. .680 Shank Diameter Forged Chisels for use in Universal Tool UT8651 through UT8654 Series Chipping Hammers and most competitive tools. Universal Tool Cape Chipping Hammer Chisel. Four Bolt Chipping Hammer Accessories. .680 Shank Diameter Forged Chisels for use in Universal Tool UT8651 through UT8654 Series Chipping Hammers and most competitive tools. Universal Tool Round Nose Chipping Hammer Chisel. Four Bolt Chipping Hammer Accessories. .680 Shank Diameter Forged Chisels for use in Universal Tool UT8651 through UT8654 Series Chipping Hammers and most competitive tools. Universal Tool Diamond Point Chipping Hammer Chisel. Four Bolt Chipping Hammer Accessories. .680 Shank Diameter Forged Chisels for use in Universal Tool UT8651 through UT8654 Series Chipping Hammers and most competitive tools. Universal Tool Moil Point Chipping Hammer Chisel. Four Bolt Chipping Hammer Accessories. .680 Shank Diameter Forged Chisels for use in Universal Tool UT8651 through UT8654 Series Chipping Hammers and most competitive tools. Universal Tool Tooth Chipping Hammer Chisel. Four Bolt Chipping Hammer Accessories. .680 Shank Diameter Forged Chisels for use in Universal Tool UT8651 through UT8654 Series Chipping Hammers and most competitive tools. Universal Tool 1-1/2'' Wide Flat Chipping Hammer Chisel. Four Bolt Chipping Hammer Accessories. .680 Shank Diameter Forged Chisels for use in Universal Tool UT8651 through UT8654 Series Chipping Hammers and most competitive tools. Universal Tool Gouge Chipping Hammer Chisel. Four Bolt Chipping Hammer Accessories. .680 Shank Diameter Forged Chisels for use in Universal Tool UT8651 through UT8654 Series Chipping Hammers and most competitive tools. The UTA88398 Universal Tool Needle Scaler Attachment for UT8630 Series Scaler is one of thousands of quality tooling products available from MRO Tools. Please browse Universal Tool Scaler and Needle Scaler Chisels and Attachments for tools similar to the UTA88398 Universal Tool Needle Scaler Attachment for UT8630 Series Scaler. UTA88398 Universal Tool Needle Scaler Attachment for UT8630 Series Scaler description summary: Universal Tool Needle Scaler Attachment for UT8630 Series Scaler. For Use With: Universal Tool Scalers and Needle Scalers. Universal Tools patented line of scalers provide users with ergonomic benefits unsurpassed in the air tool industry. Quantity discounts may be available for the UTA88398 Universal Tool Needle Scaler Attachment for UT8630 Series Scaler. Please contact MRO Tools for details.